While consumers struggle to maintain financial contributions to charities, corporate efforts are trying to fill the gap, finds the 2009 PRWeek/Barkley PR Cause Survey. Sonic, the 50-plus-year-old chain of fast-food drive-in restaurants, launched its “Limeades for Learning” campaign in September 2009. The decision to tackle education came after much deliberation about which cause and which partner would be appropriate for the company. After consulting with its franchisees and customers, the company realized that a cause program benefiting public education was a solid fit. The company recognized that teachers in the public education systems where its restaurants are located had a need for supplies to help them better do their jobs. Partnering with DonorsChoose.org, Sonic sought to raise $500,000 during the month of September to fund small projects initiated by public school teachers. Instructors registered their projects on DonorsChoose.org and customers who purchased a drink from Sonic received a unique code to use to vote for a teacher's project on LimeadesforLearning.com. The programs with the most votes received donations. At press time, 1,420 projects had received a total of $637,944 in funding. Launching a cause marketing campaign in the middle of an economic downturn might seem like odd timing, but the company wasn't dissuaded by the recession. That thinking aligns with consumer expectations, according to this year's PRWeek/Barkley PR Cause Survey. 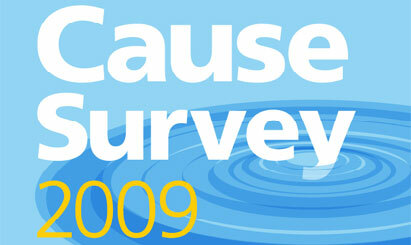 Of the 530 women polled, 91% said it was important for companies to support a cause, an increase from 86% in 2008. Moreover, 64% of consumers polled expect companies to align themselves with a cause. The survey also polled 116 marketers, 58% of whom say they engage in cause marketing. Of those, 61% plan to continue to the same level of commitment to causes in spite of the recession. In addition, of those who engage in cause marketing, 97% believe it is a valid business strategy. New Balance, which is celebrating the 20th anniversary of its relationship with Susan G. Komen for the Cure in 2009, has boosted its cause marketing spend this year. This is due, largely, to the Komen anniversary, but also because demonstrating consistent support is important, says Chris Mann, brand marketing manager for the company. The company's Web site highlights the relationship, a branded YouTube channel launched in October, and the company is reintroducing a special edition pink running shoe that can be personalized. New Balance has launched the Lace Up for the Cure Collection of fitness products, has created sales kits for its stores, and has also added anniversary logos and information to event presence. “To cut budgets behind causes during tough times would have called into question a little bit our commitment to those programs,” says Mann. Of the total sample of consumers polled, 89% have been involved with a cause over the past year, whether donating money to a charity (63%), donating items to a charity (73%), purchasing a product that benefits a cause (59%), or taking part in an event that benefits a cause (35%). Yet, 67% say the economy has had an impact on their involvement with charities. This percentage accounts for people who say they have cut back on giving to all charities (37%), eliminated some of the charities they support (14%), and don't give financially (16%). David Hessekiel, president of the Cause Marketing Forum, agrees that despite the recession companies are still executing cause marketing programs with frequency. Companies have also become more thoughtful about which nonprofits they partner with and which issues they decide to tackle, according to Swenson. In addition, companies have become more outspoken about their cause marketing efforts. Among those marketers surveyed, 82% actively promote their support of causes. Mann says New Balance has historically been reticent about its efforts, but with younger generations of consumers saying they're interested in how socially responsible corporations are, the company believes it should communicate more. According to the survey, 83% of consumers say it's important to know exactly where a corporate donation to a cause is going and the results of that donation. Of those, 60% would prefer it to be on the package, 55% on the company Web site, 42% in the advertising, and 40% in a mailer or follow-up postcards. Not surprisingly, companies that actively promote their cause marketing efforts and display involvement in a very prominent way, such as packaging, were among the most recognized by consumers. According to the survey, consumers were most familiar with the following cause programs: General Mills' “Box Tops for Education,” Yoplait's “Save Lids to Save Lives”; Avon's Breast Cancer Crusade; Dove Campaign for Real Beauty; and Tide “Loads of Hope." Particularly in this economy, companies seek a “halo effect” to counter poor corporate reputations, Swenson says. In fact, high percentages of consumers say they purchased a brand because it supported a cause (74%), would try a brand they normally wouldn't because it supported a cause (75%), or would pay more for a brand because it supports a cause that is important to them (64%). Though cause marketing involvement can impact purchase consideration, that reputational halo effect can still be difficult to achieve. According to the survey, while 37% of consumer respondents assume that the primary motivation for companies to engage in these programs is to demonstrate what they care about or to help the charity, 23% of respondents say a tax write-off is the driving force, and 20% assume it's for publicity. Yet the survey shows that companies still must do better at touting their cause marketing partnerships as a way for consumers to give back. Of consumer respondents who lowered the amount of their personal giving, only 23% are filling that gap by seeking out corporate cause programs. More and more, companies are treating their nonprofit partnerships and cause campaigns like other marketing commitments – creating programs that holistically speak to their brands and make sense to the consumer. Moreover, in order to reap results in these tough economic times, these partnerships are providing consumers with easy ways to participate, a significant element of what makes them successful. Dawn, the dishwashing detergent brand, has been serving wildlife causes in various forms for more than 30 years, says Susan Baba, external relations manager for dish care at P&G. In 1989, the company ramped up its relationship with California-based The International Bird Rescue Research Center following the Exxon Valdez oil spill, which took place in Alaska in March of that year. In the 1990s, the company had an “adopt-a-flock” program. And the company has always donated product for a variety of uses. Those who choose to increase their participation can seek out other “everyday wildlife champions” on the campaign's Facebook page. Apart from that, consumers have done their part simply by purchasing the product and going online, two things they typically do in their daily lives. While the brand asserts its longstanding commitment to helping wildlife and wildlife programs, Baba is clear that “Dawn Saves Wildlife” also has business goals. The program has been successful enough for Dawn to extend it in the US from September to December to reach its $500,000 donation goal. (In Canada, the brand already planned on running the campaign through December.) Money raised goes to The International Bird Rescue Research Center and The Marine Mammal Center. Besides the positive results with external audiences, cause programs also serve an important function for internal communications. Eighty-nine percent of corporate respondents to the survey with cause programs say they promote their efforts through internal communications and events. And 58% say they've seen an improvement in employee morale and retention as a result of these programs. Seventy-two percent say they've seen enhanced brand reputation, while 70% report PR results such as media hits. “HR would tell you that it's big for recruitment and retention,” says New Balance's Mann. To celebrate the partnership with Komen for the Cure, the company had a week of activities for its associates leading up to the Race for the Cure in Boston. “It's been brought up in people's interviews as one of the reasons they respect the company,” adds Mann, who says that it was one of the things that attracted him to New Balance. For Sonic, the positive internal effects have rippled throughout the company. With younger generations becoming more active consumers, members of the workforce, and leaders in the C-suite of companies, cause marketing programs are predicted to become even more robust and to be even more aggressively promoted. Thirty-one percent of the survey's corporate respondents who have cause programs say CEO or leadership interest in an issue is what prompted the company to launch a campaign. General Mills launched “Box Tops for Education” in 1996 by literally going school to school asking consumers to clip box tops to raise money. More than a decade later and with $300 million raised to meet a variety of school needs, it continues to grow and evolve the program in order to maintain relevance. Online participation is standard, Facebook and Twitter are big players in the program, and the number of participating brands has grown. According to Greg Zimprich, the company's director of brand PR, the key to the program's resilience is the ease with which consumers and parents can take part. The simple act of shopping at a local supermarket can earn money for a local school in need. Moreover, he credits the program's target audiences, particularly the school coordinators (comprising parents, teachers, and others) who organize the box top collections on behalf of their schools and have taken a kind of ownership of the program. While Box Tops has integrated a variety of PR strategies and tactics, most notably social media, the program is sustained primarily by the word of mouth. Last year was a record one for box top redemptions, totaling $50.6 million, Zimprich says. The program also added 3,400 schools, bringing the total of participant schools to more than 69,000. Tide introduced its “Loads of Hope” program after Hurricane Katrina struck New Orleans in 2005. The laundry detergent brand sent a “mobile laundromat” to wash, dry, and fold laundry for affected families. Since Katrina, the program has sent product and traveled to other disaster areas. Loads of Hope plans to begin a new PR effort this month and once again introduced its eye-catching packaging in October – yellow caps on participating bottles of Tide – to let consumers know they're purchasing a product that benefits a cause. Consumers who buy a participating bottle of Tide enter a code online and a portion of the purchase is donated to help families in need. Consumers can also buy T-shirts online (the entire price is donated) and connect with the program on Facebook and Twitter. Tide has also partnered with FeedingAmerica and other local groups to help during a disaster situation when many are cut off from phones, TV, and the Internet. Consumer: The survey polled 530 women, 280 with children and 250 without. The median age of respondents was 40. Of the respondents, 81% were Caucasian, 6% were black, 6% were Hispanic, 4% were Asian, and 2% were other. The median annual household income for respondents was $46K. Corporate: The survey's 116 respondents included the following marketing/communications titles: director of marketing (27%); VP of marketing (16%); marketing manager (14%); director of PR/comms (11%); VP of PR/comms (10%); SVP of PR/comms (6%); PR/comms manager (9%); CMO (3%); SVP/EVP of marketing (4%). The PRWeek/Barkley PR Cause Survey was conducted by CA Walker from August 18-September 1, 2009. E-mail notification was sent to approximately 5,914 marketing professionals and 7,385 consumers. A total of 116 marketing professionals and 530 female consumers (280 women with children and 250 women without children) completed the survey online. The results are not weighted and are statistically tested at a confidence level of 90%. Complete survey results are available for purchase for $150 by e-mailing Erica.Iacono@prweek.com.